Our reminders feature helps pet owners with busy schedules or several caretakers working with their pets. Even though we all love our pets, sometimes it's hard to remember every single medication dose. You can now set up reminders to help simplify pet care. 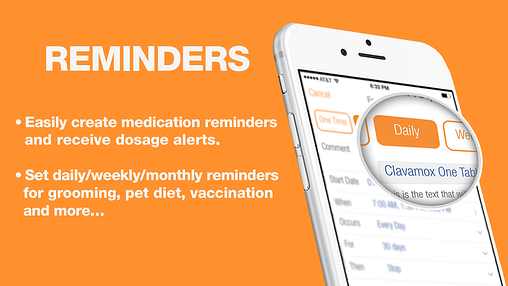 Once the reminders are set, the VitusVet app will notify you when it is time for your pet to take his or her medicine. If your veterinarian is a part of the VitusVet network, you will also be able to request new or follow up appointments with a single click. Scheduling appointents has never been easier! Join us today, and feel free to contact us with any questions or comments, we'd love to hear from you!